The Reverie mega yacht, the 52nd largest private yacht in the world, underwent an extensive retrofit under Aereon Marine's care. ICI took care of many different tasks for the retrofit. A new, improved communications mast was designed and built. Deck cranes were analyzed to determine their weight ratings. A new bridge with updated navigation instruments was designed and built. 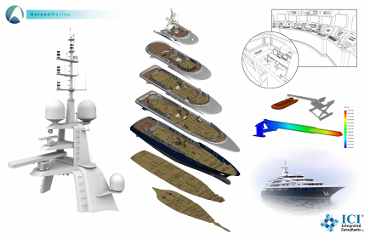 The entire yacht was modeled in 3D to aid in future work.